Qufu (pronounced [tɕʰý.fû]; Chinese: 曲阜) is a city in East China's Shandong province. 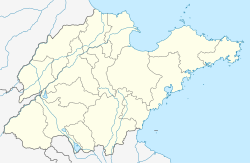 It is located about 130 kilometres (81 mi) south of the provincial capital Jinan and 45 km (28 mi) northeast of the prefectural seat at Jining. Qufu has an urban population of about 60,000, and the entire administrative region has about 650,000 inhabitants. Qufu is best known as the hometown of Confucius, who is traditionally believed to have been born at nearby Mount Ni. The city contains numerous historic palaces, temples and cemeteries. The three most famous cultural sites of the city, collectively known as San Kong (三孔; 'the Three Confucian [sites]', are the Temple of Confucius (Chinese: 孔庙; pinyin: Kǒngmiào), the Cemetery of Confucius (孔林; Kǒnglín), and the Kong Family Mansion (孔府; Kǒngfǔ). Together, these three sites have been listed as a UNESCO World Heritage Site since 1994. During the Shang, the area around Qufu was home to the people of Yan, who were counted by the Chinese among the "Eastern Barbarians" or Dongyi. Along with Pugu (around Binzhou) and Xu (along the Huai River), Yan joined the Shang prince Wu Geng and the Three Guards in their failed rebellion against the Duke of Zhou c. 1042 BC. After the rebels' defeat, the Duke launched punitive campaigns against the Dongyi, forcing their submission and placing their territory under loyal nobles. The territory of the Yan became part of the state of Lu, who made Qufu their capital throughout the Spring and Autumn period. This city had walls considerably larger than the present Ming-era fortifications, including more land to the east and north. During the Tang Dynasty and the early days of the Song Dynasty the city was centered around the present-day Temple of Duke Zhou, at the northeastern corner of today's walled city. At 1012, Qufu was renamed to Xianyuan County (仙源县), and relocated to the new site, some 4 km (2.5 mi) east of today's walled city, next to the supposed birthplace of the legendary Yellow Emperor and the tomb of his son Shaohao. A temple in honor of the Yellow Emperor was built there; all that remains today are two giant stelae (the Shou Qiu site). After the conquest of the northern China by the Jurchens, the new Jin Dynasty renamed Xianyuan back to Qufu (in 1142), but the city stayed at its Song location. It was not until the reign of the Jiajing Emperor of the Ming Dynasty (1522) that the present-day city wall was built. The site of the city in 1012–1522 is now Jiuxian Village (旧县村). During the Southern Song dynasty the descendant of Confucius at Qufu, the Duke Yansheng Kong Duanyou fled south with the Song Emperor to Quzhou in Zhejiang, while the newly established Jin dynasty (1115–1234) in the north appointed Kong Duanyou's brother Kong Duancao who remained in Qufu as Duke Yansheng. From that time up until the Yuan dynasty, there were two Duke Yanshengs, one in the north in Qufu and the other in the south at Quzhou. An invitation to come back to Qufu was extended to the southern Duke Yansheng Kong Zhu by the Yuan dynasty Emperor Kublai Khan. The title was taken away from the southern branch after Kong Zhu rejected the invitation, so the northern branch of the family kept the title of Duke Yansheng. The southern branch still remained in Quzhou where they lived to this day. Confucius's descendants in Quzhou alone number 30,000. The Hanlin Academy rank of Wujing boshi 五經博士 was awarded to the southern branch at Quzhou by a Ming Emperor while the northern branch at Qufu held the title Duke Yansheng. Kong Ruogu (孔若古), also known as Kong Chuan (孔傳) 47th generation was claimed to be the ancestor of the Southern branch after Kong Zhu died by Northern branch member Kong Guanghuang. In 1948, Qufu played a minor role in the Yanzhou Campaign of the Chinese Civil War. The artifacts of the historical sites at Qufu suffered extensive damage during the Cultural Revolution when about 200 staff members and students of Beijing Normal University led by Tan Houlan (谭厚兰, 1937–1982), one of the five most powerful student leaders of the Cultural Revolution, came to Qufu and destroyed more than 6000 artefacts in November 1966. 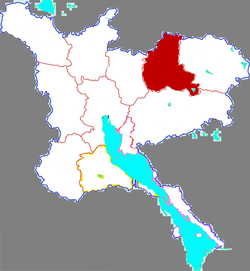 Before the wide adoption of Pinyin, the name of the city (often viewed as a county seat, i.e. Qufu xian) was transcribed in English in a variety of ways, such as Ch'ü-fou-hien, Kio-feu-hien, Kio-fou-hien,Kiu-fu,Kiuh Fow, Keuhfow, Kufow, and Chufou. The small historical center of Qufu is surrounded by the restored Ming-era city wall and rivers/moats. The Drum Tower (Gulou) is in the center of the walled city; the Temple of Confucius (Kong Miao), Confucius Mansion (Kong Fu) and the Temple of Yan Hui (Yan Miao) occupy large sections of the land within the wall. The Confucius Cemetery (Kong Lin) is located 1.3 km (0.81 mi) to the north of the walled city. The modern downtown is located south of the walled city. There is also a mosque and a thriving Muslim neighborhood and market that is located just outside the west gate of the walled city. The Qufu train station and major industrial areas are on the east side, a few kilometers east of the historical city. The Shaohao Tomb (少昊陵; Shǎohào Líng) and Shou Qiu historical site (寿丘; Shòu Qiū, the purported birthplace of the legendary Yellow Emperor), are on the eastern outskirts of the modern Qufu as well, near Jiuxian village. The original Beijing–Shanghai Railway, constructed in the early 20th century, bypasses Qufu. For a century, most passengers traveling to or from Qufu, would use the train station at Yanzhou, some 15 km (9.3 mi)to the west. Much later, a railway branch was constructed from Yanzhou to the sea port of Rizhao (part of the Xin-Shi Line, 新石铁路). This line passes through Qufu, with a small passenger station operating on the southeast side of the city (35°34′58″N 117°01′30″E﻿ / ﻿35.582860°N 117.025091°E﻿ / 35.582860; 117.025091); it is, however, of limited utility to most travelers. The Beijing–Shanghai High-Speed Railway, which opened in 2011, runs through Qufu. This line's Qufu East Railway Station is located a few kilometers south-east of the city (35°33′23″N 117°03′49″E﻿ / ﻿35.556390°N 117.063656°E﻿ / 35.556390; 117.063656). In 2015, plans were announced for the construction of a high-speed line from Qufu via Linyi to Huai'an within the next few years. If this project in implemented, it will make Qufu East a junction station. Within two years after the death of Confucius, his former house in Qufu was already consecrated as a temple by the Duke of Lu. In 205 BC, Emperor Liu Bang of the Han Dynasty was the first emperor to offer sacrifices to the memory of Confucius in Qufu. He set an example for many emperors and high officials to follow. Later, emperors would visit Qufu after their enthronement or on important occasions such as a successful war. In total, 12 different emperors paid 20 personal visits to Qufu to worship Confucius. About 100 others sent their deputies for 196 official visits. The original three-room house of Confucius was removed from the temple complex during a rebuilding undertaken in 611 AD. In 1012 and in 1094, during the Song Dynasty, the temple was extended into a design with three sections and four courtyards, around which eventually more than 400 rooms were arranged. Fire and vandalism destroyed the temple in 1214, during the Jin Dynasty. It was restored to its former extent by the year 1302 during the Yuan Dynasty. Shortly thereafter, in 1331, the temple was framed in an enclosure wall modelled on the Imperial palace. After another devastation by fire in 1499, the temple was finally restored to its present scale. In 1724, yet another fire destroyed the main hall and the sculptures it contained. The subsequent restoration was completed in 1730. Many of the replacement sculptures were again destroyed during the Cultural Revolution in 1966. In total, the Temple of Confucius has undergone 15 major renovations, 31 large repairs, and numerous small building measures. The temple complex is the second largest historical building complex in China (after the Forbidden City)—it covers an area of 16,000 square metres (170,000 sq ft) and has a total of 460 rooms. Because the last major redesign following the fire in 1499 took place shortly after the building of the Forbidden City in the Ming Dynasty, the architecture of the Temple of Confucius resembles that of the Forbidden City in many ways. The main part of the temple consists of 9 courtyards arranged on a central axis, which is oriented in the north-south direction and is 1.3 kilometres (0.81 mi) in length. The first three courtyards have small gates and are planted with tall pine trees, they serve an introductory function. The first (southernmost) gate is named "Lingxing Gate" after a star in the Great Bear constellation, the name suggests that Confucius is a star from heaven. The buildings in the remaining courtyards form the heart of the complex. They are impressive structures with yellow roof-tiles (otherwise reserved for the emperor) and red-painted walls, they are surrounded by dark-green pine trees to create a color contrast with complementary colors. The main buildings are the Stele Pavilions (e.g., Jin and Yuan Dynasties, 1115–1368), the Kuiwen Hall (built in 1018, restored in 1504 during the Ming Dynasty and in 1985), the Xing Tan Pavilion (simplified Chinese: 杏坛; traditional Chinese: 杏壇; pinyin: Xìng Tán, Apricot Platform), the De Mu Tian Di Arch, the Dacheng Hall (built in the Qing Dynasty), and the Hall of Confucius' Wife. The Dacheng Hall (Chinese: 大成殿; pinyin: Dàchéng diàn, Great Perfection Hall) is the architectural center of the present day complex. The hall covers an area of 54 by 34 metres (177 by 112 ft) and stands slightly less than 32 m (105 ft) tall. It is supported by 28 richly decorated pillars, each 6 m (20 ft) high and 0.8 m (2 ft 7 in) in diameter and carved in one piece out of local rock. The ten columns on the front side of the hall are decorated with coiled dragons. It is said that these columns were covered during visits by the emperor in order not to arouse his envy. Dacheng Hall served as the principal place for offering sacrifices to the memory of Confucius. In the center of the courtyard in front of Dacheng Hall stands the "Apricot Platform", which commemorates Confucius teaching his students under an apricot tree. Each year at Qufu and at many other Confucian temples a ceremony is held on September 28 to commemorate Confucius' birthday. The Cemetery of Confucius (孔林; Kǒng Lín) lies to the north of the town of Qufu. The oldest graves found in this location date back to the Zhou Dynasty. The original tomb erected here in memory of Confucius on the bank of the Sishui River had the shape of an axe. In addition, it had a brick platform for sacrifices. The present-day tomb is a cone-shaped hill. Tombs for the descendants of Confucius and additional stela to commemorate him were soon added around Confucius' tomb. Since Confucius' descendants were conferred noble titles and were given imperial princesses as wives, many of the tombs in the cemetery show the status symbols of noblemen. Tombstones came in use during the Han Dynasty, today, there are about 3,600 tombstones dating from the Song, Yuan, Ming and Qing dynasties still standing in the cemetery. In 1331 construction work began on the wall and gate of the cemetery. In total, the cemetery has undergone 13 renovations and extensions. Eventually, by the late 18th century, the perimeter wall reached a length of 7.5 km (4.7 mi), enclosing an area of 3.6 square kilometres (1.4 sq mi). In this space, the tombs of more than 100,000 descendants of Confucius, who have been buried there over a period of about 2000 years, can be found. The oldest graves date back to the Zhou Dynasty, the most recent of which belong to descendants in the 76th and 78th generation. During the Cultural Revolution, the Kong family cemetery was branded a "reactionary" site and was subject to vandalism and desecration. The tombs of Confucius and his descendants were dug up, looted and flattened. Confucius statue was pulled down and paraded through the streets. According to statistics published after the Cultural Revolution, 100,000 volumes of classical texts were burned, 6,618 cultural artefacts were destroyed or damaged, one thousand stelae were smashed, 5,000 ancient pines were felled and over 2,000 graves were dug up during the period. The corpse of the 76th Duke of Qufu was removed from its grave, hung naked from a tree in front of the palace and later incinerated. More than 10,000 mature trees give the cemetery a forest-like appearance. A road runs from the north gate of Qufu to the exterior gate of the cemetery in a straight line. It is 1,266 m (4,154 ft) in length and lined by cypresses and pine trees. Along this road lies the Yan Temple, dedicated to Confucius' favorite student. The direct descendants of Confucius lived in the Kong family Mansion (孔府; Kǒng Fǔ) located to the east of the temple. They were in charge of tending to the temple and cemetery. In particular, they were in charge of conducting elaborate religious ceremonies on occasions such as plantings, harvests, honoring the dead, and birthdays. The Kong family was in control of the largest private rural estate in China. The first mansion was built in 1038 during the Song dynasty and was originally connected directly to the temple. During a rebuilding in 1377 directed by the first Ming dynasty Emperor, it was moved a short distance away from the temple. In 1503, it was expanded into three rows of buildings with 560 rooms and—like the Confucius Temple—9 courtyards. The mansion underwent a complete renovation in 1838 only to perish in a fire 47 years later in 1887. It was rebuilt two years later; the cost of both 19th-century renovations was covered by the Emperor. Today, the mansion comprises 152 buildings with 480 rooms, which cover an area of 12,470 square metres (134,200 sq ft). Its tallest structure is the four-story refuge tower (避难楼; Bìnán Lóu) that was designed as a shelter during an attack but was never used. The family mansion was inhabited by descendants of Confucius until 1937, when Confucius' descendant in the 76th and 77th generations fled to Chongqing during the Second Sino-Japanese War and later during the Chinese Civil War to Taiwan, where the head of the family still resides. Qufu's economy is based primarily on agriculture and grain production. The other main industries are food processing, textile, construction materials, chemical, coal mining, pharmacy, paper making and industrial machinery. Qufu Normal University, a top ten university in Shandong province, located in the west of Qufu city. Qufu Normal University is known for its undergraduate students' enthusiasm in pursuing graduate degree through the graduate entrance examination, a nationwide standard examination held each year in China. Qufu is a traditional centre of Confucianism, being the area where Confucius was born. The city is home to the holiest Temple of Confucius, to the Mausoleum of Confucius and to the Mansion of the Kong Family. In January 2016 Confucians proposed to ban Christian churches in the city, viewed by many as a holy city of Confucianism that would be desecrated by their presence. The city is home to a community of 8,000 registered Christians (1.5%), while including unregistered ones the number rises to approximately 18,000 (2.7%). The city also has a branch of the Holy Church of Confucius (孔圣堂 Kongshengtang) and hosts the headquarters of the Federation of Confucian Culture. ^ Zhongguo gujin diming dacidian 中国古今地名大词典 [Dictionary of Chinese Place-names Ancient and Modern] (Shanghai: Shanghai cishu chubanshe, 2005), 1154. Wilson, Thomas (1 August 1996). "The Ritual Formation of Confucian Orthodoxy and the Descendants of the Sage". Journal of Asian Studies. 55. doi:10.2307/2646446. Retrieved 4 April 2018 – via ResearchGate. Wilson, Thomas A. "Cult of Confucius". academics.hamilton.edu. Retrieved 4 April 2018. "confucianism". kfz.freehostingguru.com. Retrieved 4 April 2018. "Nation observes Confucius anniversary". www.chinadaily.com.cn. Retrieved 4 April 2018. "Confucius Anniversary Celebrated". www.china.org.cn. Retrieved 4 April 2018. ^ "Confucius Anniversary Celebrated". China Daily. September 29, 2006. ^ Thomas Jansen; Thoralf Klein; Christian Meyer (21 March 2014). Globalization and the Making of Religious Modernity in China: Transnational Religions, Local Agents, and the Study of Religion, 1800-Present. BRILL. pp. 188–. ISBN 978-90-04-27151-7. ^ a b https://www.researchgate.net/publication/248653434_The_Ritual_Formation_of_Confucian_Orthodoxy_and_the_Descendants_of_the_Sage p. 575. 磐安发现一处宋墓 墓主是孔子47代裔孙（图）. js.ifeng.com. Retrieved 4 April 2018. "磐安孔氏家庙". zjfeiyi.cn. April 23, 2014. 金华磐安发现一处宋代古墓 墓主疑是孔子47代裔孙--浙江省殡葬协会. www.zjbzxh.org. Archived from the original on 6 October 2016. Retrieved 4 April 2018. "孔氏六帖 南宋 孔传（孔若古）衢州派始祖". kong.org.cn. October 18, 2003. Archived from the original on June 14, 2018. ^ Wilson, Thomas A.. 1996. "The Ritual Formation of Confucian Orthodoxy and the Descendants of the Sage". The Journal of Asian Studies 55 (3). [Cambridge University Press, Association for Asian Studies]: 559–84. doi:10.2307/2646446. https://www.jstor.org/stable/2646446 p. 575. ^ "Cultural revolution in Current Events". Weekly Reader Corp. September 29, 2006. Archived from the original on April 17, 2008. Retrieved 2007-03-04. ^ Sang Ye and Geremie R. Barmé (December 20, 2009). "The Fate of the Confucius Temple, the Kong Mansion and Kong Cemetery". Chinese Heritage Quarterly. Retrieved 2017-02-16. ^ Jeni Hung (April 5, 2003). "Children of confucius". The Spectator. Archived from the original on March 21, 2006. Retrieved 2007-03-04. ^ "Qufu·China". www.qufu.gov.cn. Retrieved 4 April 2018. Wikimedia Commons has media related to Qufu.